The plastic bucket look may not be the aesthetic you want for in your kitchen – but if you’ve got as many buckets lying around as I do, it shouldn’t look out of place at all. 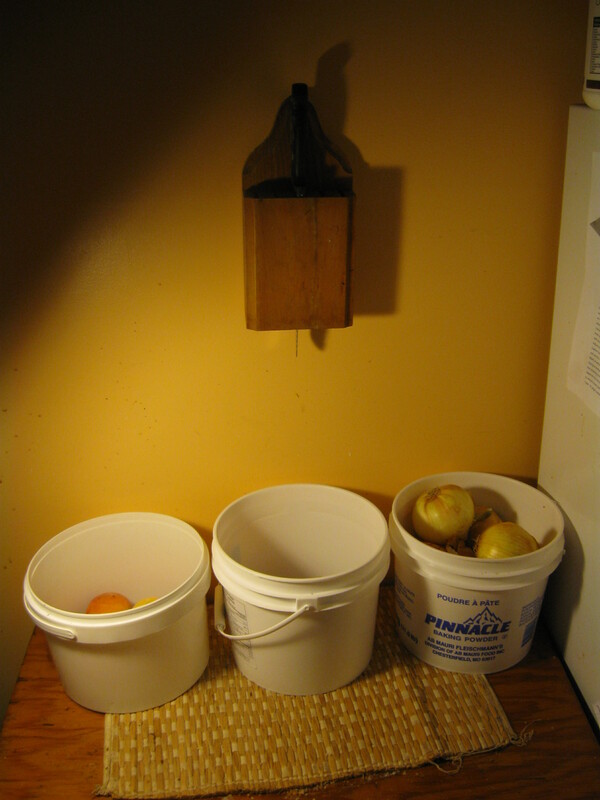 I use these pails for any fruits or vegetables that can be stored at room temperature – such as apples, potatoes, onions, garlic, peaches and bananas. I actually use similar buckets with lids in the fridge as makeshift tupperware for produce needing refrigeration. Like in the CSA box, a bit of water at the bottom can extend the life of such fruits as apples, oranges and lemons. I’ve commited a bit of five gallon bucket treason by using such small buckets, but this is just more proof that there’s no limit of uses for plastic pails!